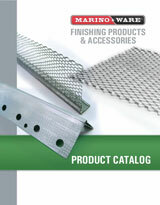 Marino\WARE® offers a quality line of drywall framing accessories and drywall finishing products. Our, paper, steel and vinyl components are furnished in uniform lengths, consistent quality, and are manufactured using industry standards. More absorbency to cure faster and prevent edge cracking. More pronounced anchors and dimples for better adherence and proper joint-compound thickness. Resistance to balling or delamination. Delamination tested in excess of 200 degrees Fahrenheit for best possible adhesive bond. Prime-grade steel with consistent, smooth finish (no waves). Fully tempered to improve strength and durability. Marino\WARE steel accessories meet all industry standards, including ASTM and AISI specifications. We provide our accessories with consistent quality, uniform lengths and we meet industry tolerance requirements. As a finishing material, vinyl carries with it several advantages; it is lightweight, durable, flexible, rust-proof, and makes for an easy installation. Our Corner Beads, Bullnoses, L Tear-Strips, Splay Beads, J-Trims, L-Trims, Control Joints are all available in vinyl.